Dec. 4, 2018 -- Did you know the Marcellus High School Counseling Office has a brand new Career Center — and a brand new career coordinator to go along with it? Former technology instructor Cathy Arvantides retired from teaching last June, but returned to campus in September to head up the Career Center, a resource for Marcellus students to research, understand and plan for their futures. The center also offers driving permit study guides and online testing in the counseling office. Two of Mrs. Arvantides’ primary goals are to update and expand career exploration opportunities for students and to assist with their job acquisition skills. With those objectives in mind, the Career Center organized three career-focused field trips this fall to afford students in grades 9-12 with the chance to match their interests with potential careers: Manufacturing Day, Construction Day and Women in Engineering Day. 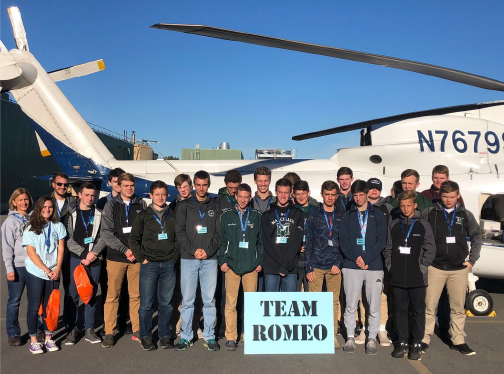 Manufacturing Day (On Oct. 5): Approximately 40 students with interests in a variety of manufacturing and engineering careers traveled to several companies for tours, hands-on activities and presentations. Some of the students visited WestRoc and Gear Motions, while another group visited Lockheed Martin. State-of-the-art technology used in the manufacturing process was demonstrated and a wide variety of STEM-related jobs were presented. The students especially enjoyed seeing a helicopter up close, talking to the pilots and witnessing its take-off. Construction Day (Oct. 11): Fifteen students attended the Construction Career Fair at the New York State Fairgrounds. Approximately 25 exhibitors and vendors were on hand to discuss the job market, certification programs, apprenticeships and on-the-job training. Through hands-on opportunities, students were also able to experience a variety of trades. Women in the STEM Workplace (Nov. 9): Three students from eighth grade and two ninth-graders visited Syracuse research and development firm SRC Inc. The young women were able to learn firsthand what it takes to work at SRC, become an engineer and learn about the foundational STEM skills needed to be successful later in life. The Career Center plans to organize more “career exploration” field trips this spring and in future school years. To that end, Mrs. Arvantides hopes to expand the center’s business contact database to include more opportunities for students to have meaningful experiences (guest speakers, field trips, job shadowing, etc.) with local businesses. If you are or know an area business that would be willing to volunteer to be a resource for Marcellus students, please go to this link to complete a very short survey: https://goo.gl/P9xn1w or contact Mrs. Arvantides directly at carvantides@marcellusschools.org or (315) 673-6311.